Excellent mix based on etherless testosterone, trenbolone and stanazolol. Great for athletes who have to go doping control. Non-ester drugs quickly turn on the work and just as quickly leave the body. Put, worked and passed dopping control. Pharma Mix 5 is an excellent combination of anabolic-androgenic steroids in one bottle to build a prominent physique. Consists of 3 components: Trenbolone, Testosterone, Winstrol. The mixture consists of esters dissolved in oil, so it will be effective to put injections before exercise for 2 hours. In the case of using Pharma Mix 5, the injections will have to be put 2-3 times a day in order to eliminate the buildup of the hormonal system! When using it should be remembered that the dosage of Trenbolone is 25 mg in 1 ml, and in the case of using 2 ml of the mixture per day, the weekly dosage is 350 mg per week. From experience, I note, not every athlete easily tolerates a dosage of Trenbolone above 300 mg per week! The manufacturer claims high bioavailability of the drug in the mix, so the effect will be even brighter. The optimal course duration is 6-8 weeks. Pharma Mix 5 – not suitable for everyone, and certainly not for beginners or amateurs due to frequent injections! This mix is ​​used only by those who know exactly what they are doing. In our opinion, optimal use of Pharma Mix 5 can be parallel with the course consisting of Trenbolone and Testosterone long esters! It will be optimal to use on the first and last week of the course, before each trip to the hall! With the help of similar Pharma Mix 5, you can gain muscle mass without accumulation of fat deposits, help fat loss, increase libido. Post-course therapy should begin the day after the last injection of Pharma Mix 5. 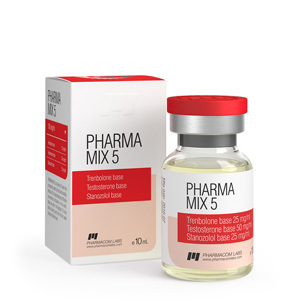 Pharma Mix 5 – make from Testosterone, which will be subject to the process of aromatization, and may cause side effects, so we strongly recommend supplementing the course with Anastrozole or Letrozole (section Anti-estrogens) in the amount of 0.5 tab. once in 2 days, starting from the 2nd day of the course and should be finished before starting the PCT. Pharma Mix 5 – made from Trenbolone – the drug is able to increase Prolactin, which reduces the effectiveness of the course, there is apathy, depression, lack of desire to train. To reduce Prolactin, Cabergoline is used (Antiestrogens section). Begin reception should be from the 2nd day of the course for 0.5 tab. every 4 days, provided the Pharma Mix dosage is 5–2 mg per day, and should be finished before starting PCT.